Reference number for this case: Summer-54-Saint-Priest-Taurion. Thank you for including this reference number in any correspondence with me regarding this case. Time of the sighting: between 12:30 P.M. and 13:00 P.M. The witness indulged in his daily walk made necessary after an hemiplegy attack of which she had been the victim 3 years earlier; this partial paralysis of the right side left her all the same the possibilities of motion and of making daily walks from 4 to 5 kilometers. 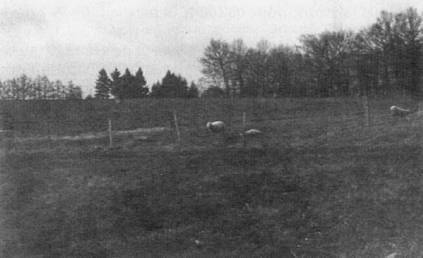 The day of the observation, the witness was towards 12h30 in a dirt track at less than 500 m of the house, on the plate of the smallfarm of of la Croze. Suddenly whereas she was at the level of an edge, in view of the crossing of the pathways of Mazeau and Croze, the witness saw a very shiny flattened hemispheric object posed in the limit of an alley of spruces and a meadow (red cross on IGN 1/25 000th map; in orange the meadow; in green, the wood). Very astonished by what she had seen, the witness made a description on his arrival at the house to her mother whom I was to make her repeat often thereafter. This thing was of a flattened shape, but round, "lenticular", and very brilliant, but one saw all the same a red dominant color with orange and yellow also, juxtaposed, the colors being spread out in strips. The object did not touch the ground on which it rested by the intermediary of a kind of tripod. It could be of 1 m to 1.50 high, at the level of the fir trees, near their branches. Size comparable with that of a large car. The witness was to observe two beings occupied to collect something around in the meadow... Mrs. M., amazed, did not move from the edge of the pathway; it does not seem that the entities noticed her. Questioned more in detail on these "beings" the witness always told than they were very small, 1 m or more or less one meter, with a very bulky head (perhaps helmeted? We never had this precision) and of metal gray color. The observant did not have the curiosity to approach the landing strip and we do not have any collected detail on this subject. 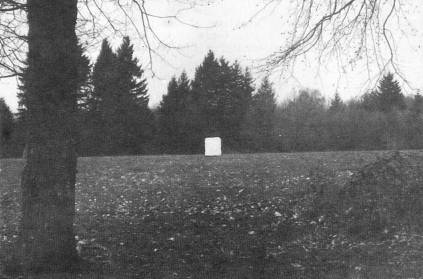 The place where the UFO was is marked with the white square. Another view of the location from a larger distance. The ufologist and author Jean Sider provides his synthesis of the case based on investigation by G. Magne. He indicates that in the summer of 1954 at an unknown date, at approximately 00:30 p.m. in Saint-Priest-Taurion, La Basse Gorce, in the Haute-Vienne, Marie-Louise M. who asked for anonymity, aged 57 at the time of the sighting, was walking. At a crossroads, she sees a shining, hemispherical, flattened object, posed on a kind of tripod at the edge of a close wood. She also notices two beings of less than one meter in height, busy gathering something around on the meadow. They had a very bulky head and a body of metal gray color. Albert Rosales indicates that in La Basse Gorce, France, in November 1954 near midnight, a woman saw a flattened lenticular shaped object that had landed on a field on a tripod-like landing gear. The craft carried shiny juxtaposed bands of yellow, red and orange colors. Two short beings were occupied in gathering items from the ground around the object. After a few minutes the beings penetrated under the UFO, which took off gently while trembling without any noise, it disappeared quickly into the distance. Albert Rosales indicates Michel Figuet as source. The website indicates that in August 1954 at 12:30 in the west of La Basse-Gorce, France, "Lens-shaped disc on tripod landing gear. two humanoids gather something from field." And: "Close encounter with a an unidentified craft and its occupants. One disc was observed on a farm for over one minute. Two dwarves were seen." 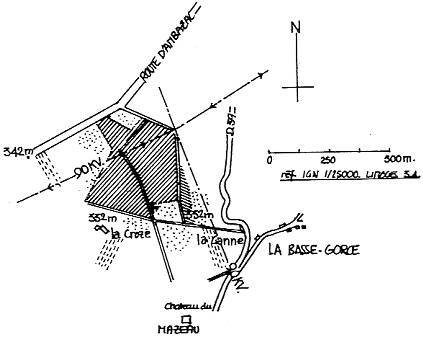 The author indicates that there was a close encounter of the third kind in the Summer of 1954 at approximately 12:30 between Saint-Priest-Taurion and La Basse Gorce, in the Haute-vienne. Marie-Louise M., who wanted to remain anonymous, 57 years old at the time, was walking when at a crossroads, she saw a shining flattened hemispherical object, posed on a kind of tripod, at the edge of a nearby wood. She also noticed two beings less than one meter in height, occupied to gather something around on the meadow. They had a very bulky head and their body was of gray metal color. The sources are indicated as Lumières dans la Nuit #196, page 26 (investigation of G. Magne). [gm1] "Rencontre rapprochée de type 3 en été 1954, Haute-Vienne", case investigation personal file, by Gilles Magne, France, 1980. [js1] "Le Dossier 1954 et l'Imposture Rationaliste", book by Jean Sider, Ramuel publisher, France, page 160, 1997. [jg1] "RR3 - Le Dossier des Rencontres du Troisième Type en France", book by Julien Gonzalez, Le Temps Présent publishers, France, page 64, 2014. 0.1 Patrick Gross August 27, 2004 First published. 1.0 Patrick Gross October 21, 2006 Conversion from HTML to XHTML Strict. First formal version. Looked for new information, none found. 1.1 Patrick Gross March 20, 2010 Addition [ud1]. 1.2 Patrick Gross October 19, 2016 Addition [jg1].